Though not a complete surprise, Amazon today revealed a new Kindle e-reader with an illuminated screen and up to eight weeks of battery life. 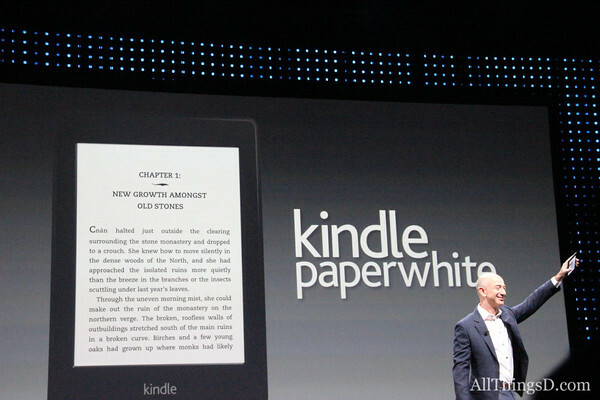 Unveiled by Amazon CEO Jeff Bezos at a press event in Santa Monica, Calif., the Kindle Paperwhite will be available on Oct. 1, with preorders starting today, and features a front-lit touchscreen that will allow you to use the e-reader during the night and day. The light is directed down toward the display, so it’s easier to read outside, and users will be able to adjust the brightness level of the light. The Paperwhite’s display also shows 25 percent more contrast, and has 62 percent more pixels than the current Kindles, at 212 pixels per inch. Amazon said its Paperwhite technology has been fours years in the making, and that part of that time was spent on making it more power-efficient than its competitors, namely the Barnes & Noble Nook Simple Touch with GlowLight. The Kindle Paperwhite promises up to eight weeks of battery life, even with the light on, which Bezos said was twice as much as the Nook offers. 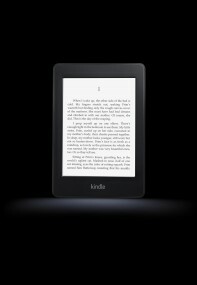 The e-reader measures just 9.1mm thick and weighs 7.5 ounces, making it “thinner than a magazine and lighter than a paperback book.” It offers a number of features that Kindle users have come to love, such as X-Ray and Whispersync, which syncs your bookmarks, notes and last page read across all devices. A new function called Time to Read will show you how much time it will take you to finish a chapter, based on its projections from your actual reading speed. The Kindle Paperwhite will come in Wi-Fi and 3G models, costing $119 and $179, respectively. Kobo also announced a front-lit e-reader just hours before Amazon’s event, but it’s more expensive than the Wi-Fi Paperwhite. The Kobo Glo goes for $129.99, while the Nook Simple Touch with GlowLight costs $139.99. To keep costs down, however, the Paperwhite does not offer audiobook support. In addition to the Paperwhite, Amazon introduced the Kindle Fire HD today, which offers 4G LTE connectivity, faster performance and an 8.9-inch touchscreen.